From putting finishing touches on its $397 million redevelopment to welcoming record numbers of visitors through its doors and playing host to some of Adelaide’s largest ever business events, it’s been a milestone year for the Adelaide Convention Centre (ACC). In the 12 months following the venue’s multi-million-dollar expansion, the ACC delivered 768 events and welcomed more than 330,000 visitors – both record numbers for the Centre. This figure includes 72 major national and international conferences, which collectively generated 172,000 bed nights and delivered more than $155 million in economic benefit to South Australia. “The response to our expanded venue has been extremely positive,” comments Simon Burgess, General Manager, Adelaide Convention Centre. The year was highlighted by the Land Forces 2018 Exposition (4-6 September), the largest single service land-defence industry event of its kind in the Indo-Asia-Pacific region. Returning to the ACC after a successful 2016 event, Land Forces 2018 attracted a record 15,331 international, national and local total attendances, up from 13,450 in 2016. In addition to providing a platform to showcase South Australia’s world-class defence industry and strengthen ties with global industry leaders, the event delivered 25,000 visitor bed nights and injected more than $34 million in economic benefit to the State. Burgess said Land Forces 2018 received positive feedback from organisers and attendees alike, and was a fantastic illustration of a major event made possible by the Centre’s recent expansion. “It was our absolute pleasure to welcome Land Forces back to Adelaide last month, and specifically to the Adelaide Convention Centre. At over 20,000sqm, it was our largest ever exhibition and provided a wonderful showcase of the Centre’s capabilities and our team’s expertise in successfully delivering complex events,” added Burgess. Additional highlights of the past year included the 68th International Astronautical Congress (IAC), which saw 4,470 delegates from 71 countries descend on the ACC in September 2017, along with the Australian Tourism Exchange (ATE18), Australia’s largest annual travel and tourism business-to-business event, which returned to the ACC in April 2018, bringing 2,200 delegates from 30 countries. Beyond a busy events calendar, during the past year the ACC successfully transformed the event culinary experience with its new Honest Goodness menu, as well as reaffirmed its global sustainability leadership by becoming the joint first convention centre in the world to achieve EarthCheck’s coveted Platinum certification. Looking ahead, the response to the expanded Adelaide Convention Centre (ACC) continues to be extremely positive. Some 94 major conference events have been secured through until the end of 2021. Collectively, they’ll bring an estimated 80,000 delegates to Adelaide, generating almost 300,000 bed nights and delivering more than $245 million in economic benefit to the State. There more than 30 conferences on the books with 1,000+ delegates. 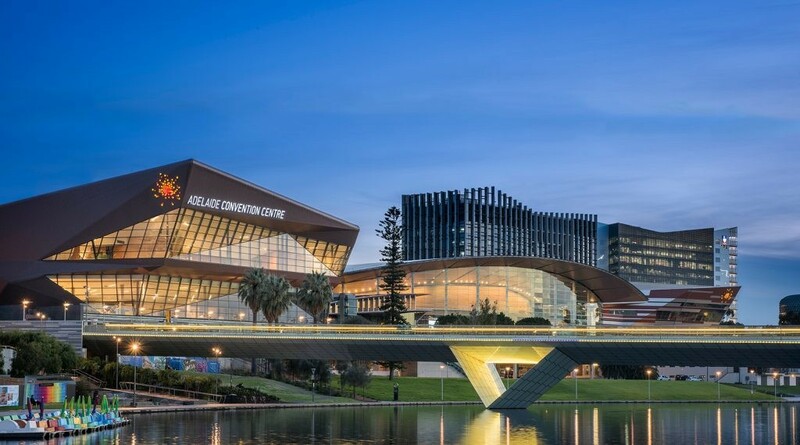 Upcoming major events collaboratively won to the destination by the Adelaide Convention Centre and Adelaide Convention Bureau include the 38th Australian Dental Congress: 2 – 4 May, 2019 (3,000 delegates); along with the World Fisheries Congress: 12 – 15 October, 2020, (1,500 delegates); and the World Indigenous People’s Conference on Education: 2 – 6 November, 2020 (3,000 delegates. The EEAA has celebrated the completion of the Adelaide Convention Centre, however wouldn’t confirm if they drank Chandon or Passion Pop.